A prior post reviewed some of the ways in which El Universidad de Centro America (the University of Central America or UCA) is commemorating the twenty-fifth anniversary of the brutal murders of six of their Jesuit brothers and professors on November 16, 1989. Here are some of the other ways. 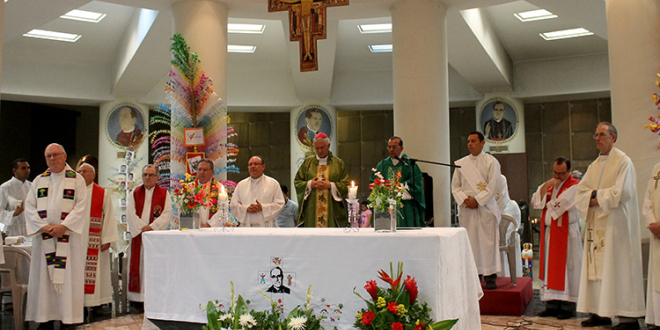 On November 16th a memorial Mass was celebrated for the martyrs at the tomb of Archbishop Oscar Romero in the Crypt of the Metropolitan Cathedral of San Salvador. All of the current Jesuits of El Salvador and others in attendance joined in songs and prayers to celebrate the work of the martyrs and to condemn the injustice of the perpetrators of this horrible crime not having been tried and convicted. Comments by Fr. Jon Sobrino, S.J. Comments by Fr. Rodolfo Cardenal, S.J.